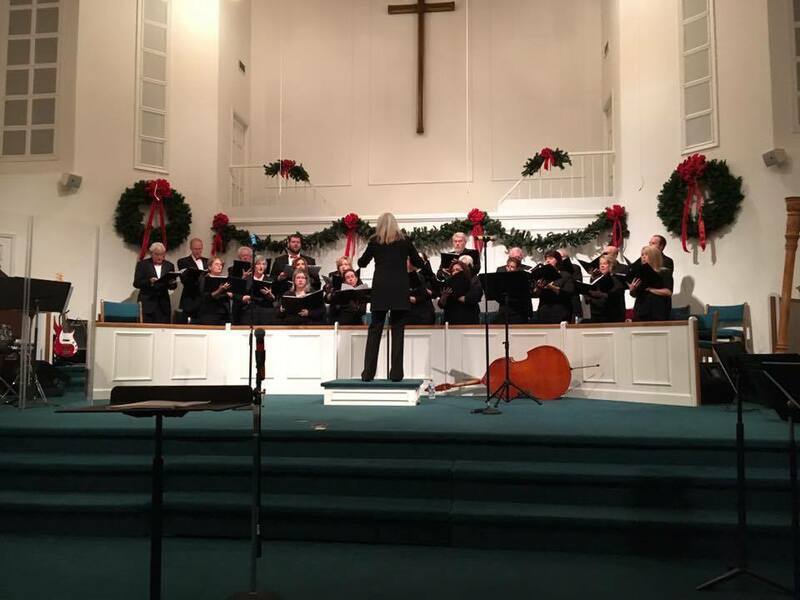 The 2018 Christmas Concert is scheduled for Monday, December 3rd at 7:00 pm, Highland Park Baptist Church, Mount Airy, NC. 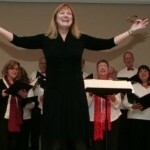 The Spring concert is VOCE’s a popular event in the concert season. Please join Artistic Director Patti Miller Fulk and all members of this extremely talented group of musicians as they perform heartfelt spiritual and gospel selections! Beautiful, melodic and soulful music along will be shared with you on this great night of entertainment! For information contact Mark Gillespie at 336-789-2035. Happy Spring to all! Please join us! 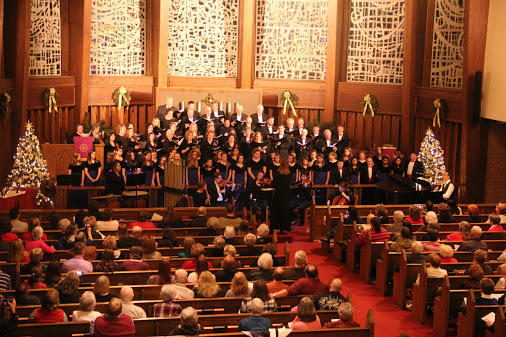 The Holiday/Christmas concert is VOCE’s most popular event of the concert season. 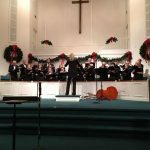 Please join Artistic Director Patti Miller Fulk and all members of this extremely talented group of musicians as they perform “An Olde World Christmas”! Beautiful, melodic and lilting Madrigal music along with more familiar Holiday tunes will be shared with you on this great night of entertainment! There will be no charge for this event however we will accept any tax deductible contributions you wish to share. VOCE is a non-profit organization. Please join me and all VOCE members at the Andy Griffith Playhouse on Monday, October 10th at 7pm. We will sit back and enjoy a night of Americana at it’s best!. VOCE will perform “Forever Disney” as their first concert of the 2016-2017 Season. It is doubtful that there is anyone more revered in modern time than Walt Disney. His genus spans over decades. Beginning in 1928 with the birth of Mickey Mouse and In 1937 he created his first feature length animated film, “Show White and the Seven Dwarfs”. Then came “Mary Poppins” in 1964 winning 13 Academy Awards. The creations associated with the Disney name were endless. 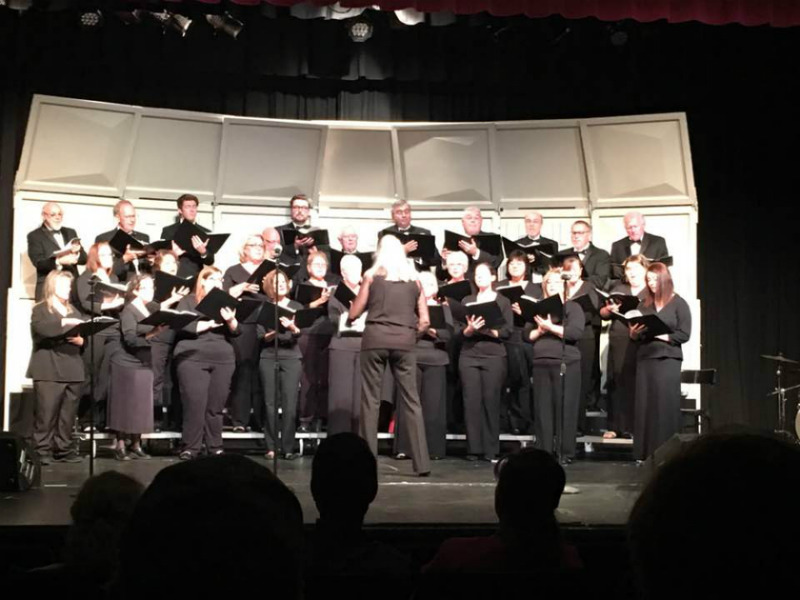 Under the Direction of Master Musician, Patti Miller Fulk, VOCE will perform music Disney created through the years. Along with the Classics, more contemporary works such as Pocahontas, The Lion King and The Little Mermaid will come to life. . There will be no charge for admission however we will accept your tax deductible donations, Feel free to contact Mark Gillespie at 336-789-2035 for information. 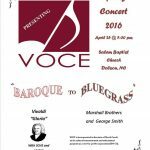 Please join us for the VOCE Spring Concert on Monday evening April 25 at 7:30 pm. The concert will be held at Salem Baptist Church on Rockford Road in Dobson, NC. From Baroque to Bluegrass! 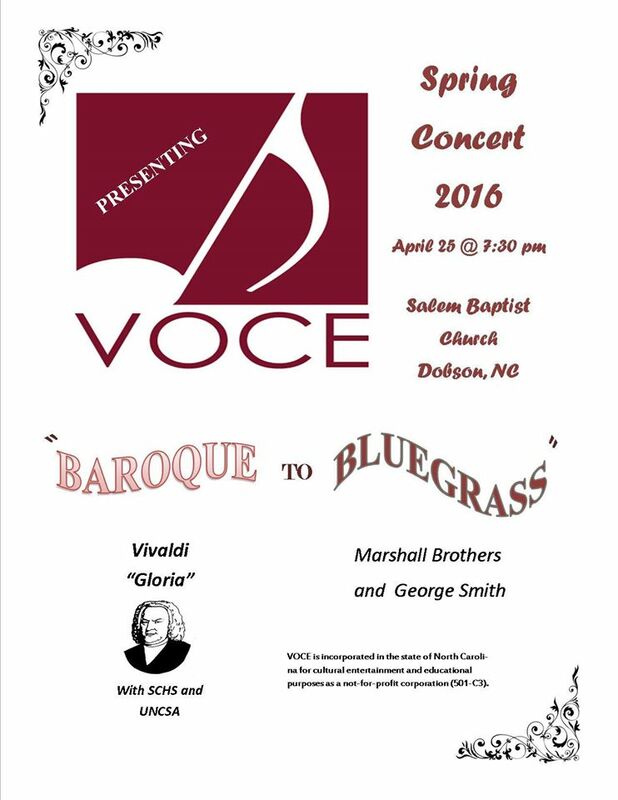 In addition to the talents of VOCE, the concert will feature the Surry Central High School Chorus, UNC School of the Arts, The Marshall Brothers and George Smith. What a treat you have in store for this production. Please join us. No admission fee, but donations are appreciated. 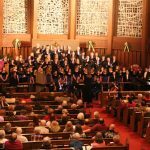 Please mark you calendars to reserve the date for Voce’s Annual Christmas Concert. It will be held on Monday, December 21 at 7:00 pm at Highland Park Baptist Church! We hope to see you there to listen to the sounds of the season! Come join us as we begin rehearsals for the 2015-16 Season for Voce. The first rehearsal will be on Monday evening, September 14 at First Baptist Church of Dobson. We will begin the evening with a “Meet and Greet” Social from 6:00-7:00 pm. We would like to invite all past, current, and prospective members to this social. Rehearsal will follow at 7:00 pm. We hope to see you there. 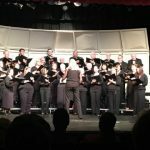 Come join us for an evening of wonderful music by our premier choral group in the area! We would love to have you! Following is a link to the article from the Mt. Airy News regarding the upcoming concert!